It all starts with an idea. We take concepts or scripts and turn them into high quality, effective videos. When you collaborate with 336 Productions you get a team that understands your priorities, and works hard to exceed your expectations. From compelling scripts, to impressive cinematography, to cool and clean graphics, to creative editing, to pristine audio – we are experts in all aspects of the creative process. Whether your video is for the web or broadcast, we can deliver your project in whatever format is required. We optimize our workflow depending on the type of distribution needed. We use the latest equipment, techniques, and software to make sure our client’s projects are cutting-edge. We judge ourselves based on the results and success our client’s have with the videos we produce. 336 Productions was the first—and remains the only—production company that I’ve worked with that made me want to think up additional video projects just so that I could continue working with them. Their knowledge, expertise and professionalism is only surpassed by their genuine kindness and easygoing style. But don’t get me wrong, easygoing does not mean slow and overly relaxed. When the pressure cranks up and deadlines shorten, they deliver. Everyone at 336 Productions was an absolute pleasure to work with – professional, timely, knowledgeable, and fun! Marlowe and Josh were able to easily and skillfully take us from project inception to completion and help Ayres Hotels realize our vision with a gorgeous end product. We would not hesitate for a moment to utilize the services 336 Productions provides for future video production needs – they are AMAZING! How do you tell your company story in a 90 second or less video? 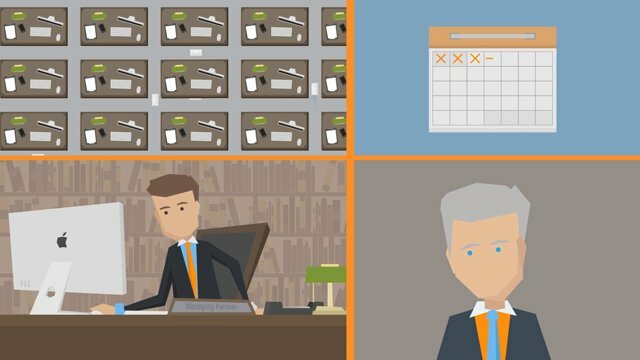 That was our challenge and 336 Productions helped us boil down a lot of technical jargon and complicated ideas into a professional and concise explainer video. Now our website visitors know exactly what we do. 336 had a very methodical design process that was easy to follow. The customer service and expert advice was top notch and very appreciated. As one of the premier video vendors in Orange County, 336 Productions has specialized in branded video production since 2008. Whether you’re a global tech company based in Santa Monica looking for a Los Angeles video marketing service, or a retail startup looking for a video production company in Riverside, 336 is a professional video production company with over a decade of experience in the corporate video and marketing industries. 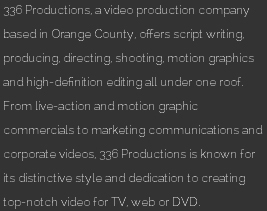 Even though 336 is based in Costa Mesa, CA, it serves all of Southern California, so if you came here by Googling “video production company Los Angeles CA” or “video production Riverside” or “corporate video San Diego” or “Los Angeles production company,” you’re in the right place! We don’t do boring, cheesy, or bad, we’re only interested in producing the best educational, promotional, and marketing videos for our clients. Give us a call or send us an email for the best corporate video Los Angeles, Orange County, Riverside, and San Diego has!